When a demonstration copy of The Bonny Bunch of Roses arrived some two months ago I could not wait to review the completed version of this truly sumptuous album. I’d first heard Seán sing one night in The Cobblestone in Dublin where, for most of the evening, he had been content to provide guitar accompaniment in a session. It was an enthralling experience, beckoned in by Neillidh Mulligan’s sudden interruption of our conversation with the words, “Sssh, Seán’s going to sing”. Talk of uilleann pipes could attend while this slight, bearded figure held us rapt for five minutes or so. It had been a quiet night in The Cobblestone and the clientele grew appreciatively more silent while Seán sang. I cannot recall what he sang that night, but that was of little import compared to the sense of discovery imbuing its way into my cranial cortex. Seeking out any previous recordings by this man became imperative. Sadly, despite the length of his career (Seán has been active musically since the early 1970s), I found only one previous full-length album, Ón dTalamh Amach (‘Out of the Ground’) which he had released on his own Harry Stottle label in 1998 and an appearance on an album from the same year, Sessions from the Hearth. For those not familiar with the latter, it consists of a live concert recorded at Siamsa Tire (The National Folk Theatre of Ireland) in Tralee and features musicians such as the fiddler Malachy Bourke, Éamonn de Barra on flute and Enda Scahill on banjo. Seán sang a splendid solo version of a song called here You Can’t Boil Potatoes, a rousing ditty recounting how women attempting to enrol for a cookery class run by Kerry County Council in Cahirciveen were refused entry if they signed their names in Irish. The event took place in 1906 and the song was composed by an Irish language campaigner, Briain Ó hUiginn. Whether his efforts were written after the furore had settled down and the women finally admitted to the course is unclear, but what is certain is that the song resurfaced on Ón dTalamh Amach, where Seán ascribes it a new title, Haute Cuisine in Cathair Saidhbhín (the Irish name for Cahirciveen or Cahirsiveen, as it is sometimes spelt). Cahirciveen is Seán Garvey’s birthplace and the town and its surrounding area (part of the tourist-ridden Ring of Kerry) is very dear to him. Ón dTalamh Amach featured another song relevant to the area, The Boys of Barr na Sráide, written by the town’s best-known composer Eddie ‘Sigerson’ Clifford (whose works have also been recorded by Tim Dennehy). Other songs were learnt during Seán’s time living in Connemara or on his travels in Clare while Seán’s instrumental skills on flute, whistle, banjo and harmonica were aired on tunes such as The Harvest Home, learnt from two brothers from the travelling Dunne family who used to busk at the annual Cahirciveen horse races. However, the album’s crowning glory is Seán’s nine-minute rendition of Laurel Hill, sometimes known as Sweet Laurel Hill or Kyle’s Flowery Braes, found in the Sam Henry collection Songs of the People, but sung here to the same tune employed by Frank Harte on My Name is Napoleon Bonaparte. Naturally, as someone who spent a considerable time immersed in the latter album (see my review), it is tempting to make comparisons between the two singers, but I am reluctant to do so, for the simple reason that both Seán and Frank make the song their own in completely different and distinct ways. Seán’s strengths lie in the intensity of his voice and his innate expressive abilities, making him one of the most superb song interpreters. Simultaneously, these qualities are supported by the understanding of his arrangements, so subtle at times that it defies expectancy. 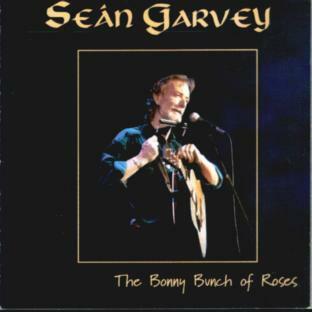 Additionally, Seán is a distinctive guitarist and its a display of these instrumental skills, a solo finger-picked rendition of Carolan’s Draught, which graces the opening track of The Bonny Bunch of Roses. Seán being a naturally inquisitive character, this and the majority of songs and tunes on the album are accompanied by detailed, researched liner notes. Carolan’s Draught immediately gives away to Mick Kinsella’s atmospheric harmonica opening to the Cyril Tawney song, The Ballad of Sammy’s Bar. Coincidentally, this song also appears on Jerry O’Reilly’s recent album, Down from Your Pulpits, Down from Your Thrones! – a little like a number 134 bus: wait for ages and two appear at the same time. Jerry cites Seán as being one of the first people he heard singing the song, but Seán’s version is light years in difference to his own. Garvey fully embraces the song’s subject of unrequited love. The story’s simple: a man goes to a bar and discovers that his true love prefers Johnny, seemingly on the grounds that the latter owns an American car; resolving to win back his love, the protagonist abjures booze, presumably to be both sober and solvent enough to hire his own ’Yankee car’; next Johnny fails to negotiate a hairpin bend and ‘For my love it was the end’; so, finally, back goes our anonymous hero to drown his sorrows at Sammy’s Bar. Simple, trite, but, in Seán’s hands, it’s a masterpiece. There will be joy and exultation on Sliabh na mBan. Following the pleasant instrumental interlude of a set of double jigs (Seán on flute, Liam Lewis on fiddle) we arrive at the second song in Irish, Éamon Mhágaine (again a translation is provided). As Seán notes, the song has several regional variants. Here, thanks to the reference to the road from Cork to Douglas, it is clear which one he is singing unaccompanied. This essentially emphasizes another of the Garvey strengths, the sean-nós delivered here with that melodic certainty which characterizes many of the great Kerry singers. This song of hope and longing is delivered at the slowest of tempos with Lewis’s fiddle and Kinsella’s mouth organ soaking up the slow pace of Outback life as Seán recounts the pain of waiting without ever wallowing in the melancholy for which Lawson’s songs were often criticized. The mood is somewhat uplifted by the subsequent The Broken-Down Squatter which, despite the depressive connotations of its title, has a rather jaunty tone. This one was penned by the Queenslander Charles Flower and first published in 1894 and the ‘squatter’ refers to a large-scale sheep-farmer in Australian slang. The song echoes the economic problems facing Australian agriculture in the 1890s and its subject recounts all its problems and his efforts to overcome them, while ever encountering governmental and legal exigencies. However, the black mood returns with The Weary Gallows from Sam Henry’s Songs of the People collection. Another long song, this ballad, while resulting in the happy ending of a reprieve from said gallows, takes us through all the pain of the waiting lover. Again, Seán’s delivery is absolute perfection. Another instrumental break, a set of reels made resonant by the drone of Eoghan Garvey’s pipes, takes us to the title track, one of the great songs of the Irish tradition, The Bonny Bunch of Roses and, boy, is it given the delivery it deserves – a telling, trenchant, benchmark rendition, recorded live in concert in County Clare. The Irish penchant for occasional over-indulgence in sentimentality cannot be gainsaid, and for which, no doubt, there are complex socio-historical reasons. Here’s my contribution! On a more serious note he does provide the justification that it was commonplace for local singers in South Kerry ‘to have a song of North American provenance in their repertoires...’ Well, of course, this applies equally to most parts of rural Ireland. The album ends with another solo guitar piece, For Rosie and Countess, providing a neat bookend to the whole work which (and it ought to be firmly mentioned at this point) was produced with customary excellence by P.J. Curtis. It’s a telling point that a singer as skilled as Seán Garvey does not yet have a UK distributor for this wholehearted tour de force of an album. So, for the moment, prospective purchasers can contact him at seangarvey@eircom.net. This review by Geoff Wallis was originally written for Musical Traditions. For more information about Seán Garvey visit www.seangarvey.ie.